Trying to get enough veggies into your diet? 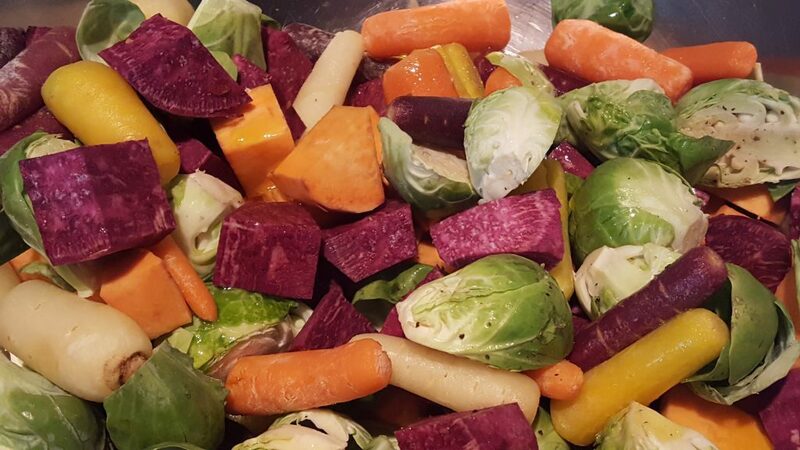 Here’s a simple and easy and quick way that will keep you in healthy colorful vegetables all week. The colors of this recipe prompted the title “trifecta.” Not only is it a beautiful dish, it’s also a win-win! This two pan technique will keep you in delicious veggies for a week. Peel and chop sweet potatoes into 1 inch cubes. In a large bowl, toss potatoes, Brussels sprouts, and carrots with 1/8 c. olive oil. Season with salt and pepper. Spread mixture on a large sheet pan lined with a silicon pad or parchment paper. Place in oven for 20 minutes, stirring after the first 10 minutes. For even roasting, you may want to rotate pan as well after the first 10 minutes. 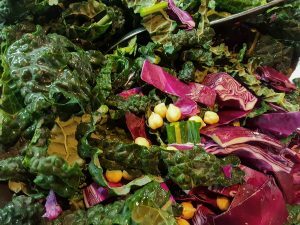 While the root veggies are roasting, rough chop kale and place in the same large bowl that was used to toss the root vegetables. Rough chop red cabbage and place in bowl. Remove both sheets from the oven, toss all veggies together and serve. *I used some already cleaned and seasoned Brussels sprouts from Sprouts. You can toss these veggies with brown rice or quinoa and add a bit of tahini dressing for a delicious meal. Or simply use them as a side with your choice of protein, like Chipotle-Lime Chicken. 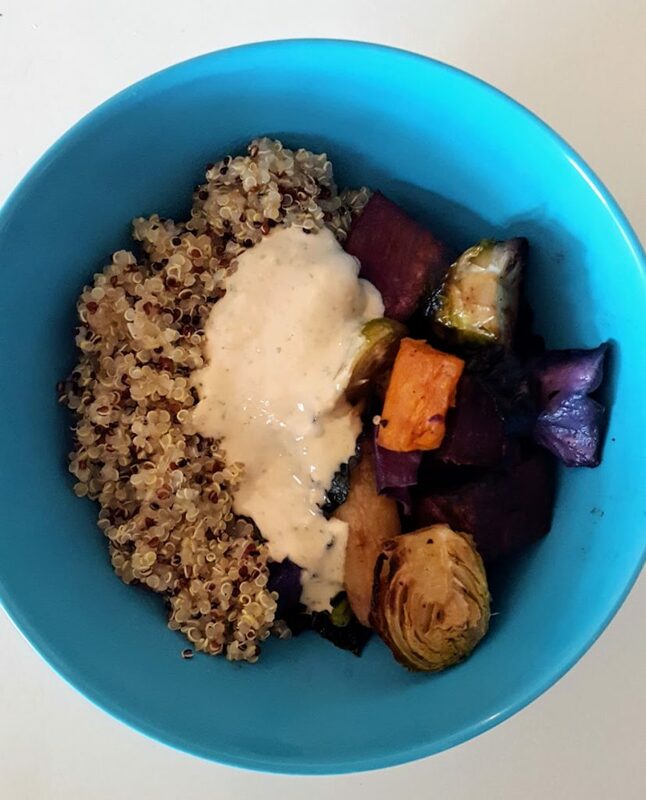 Here is a lunch we had with tri-colored quinoa, said veggies and a dollop of that tahini dressing. 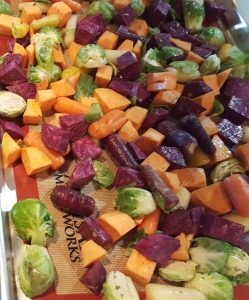 I know that almost every single one of these veggies is totally out of season but when I saw the purple sweet potatoes at Sprouts, I just couldn’t resist. Linking up with Deb’s Souper Sunday. This was a beautiful dish to create. What a great way to cook veggies! Love the color and texture, and I know the flavor is outta sight! Thanks for this. I will be using this method a lot (especially this fall and winter when all this stuff is more seasonal!). This is my kind of meal, love roasted veggies, have never roasted kale like this, will give it a try. Just watch the kale carefully. I would also put it on as a bottom layer. Love that purple and this dish! This would persuade anyone to eat their veggies! Yum! Your lunch looks just my style!! 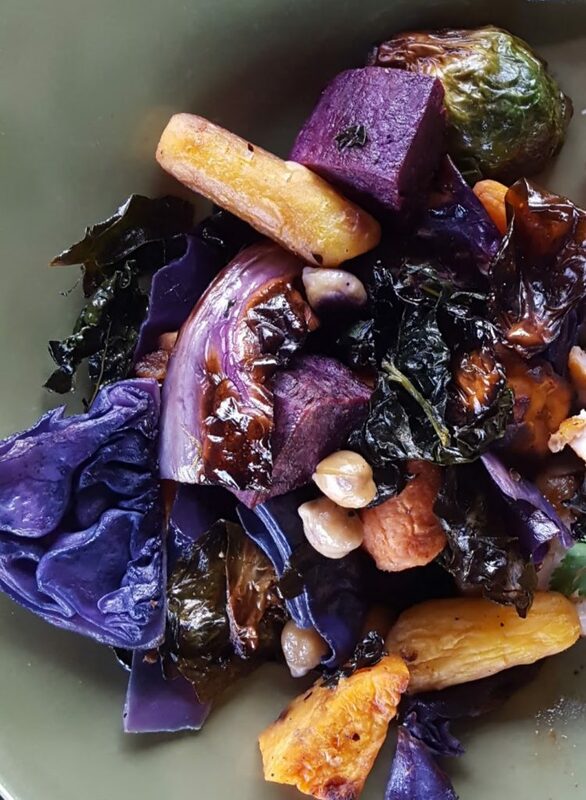 And at first I thought those purple sweet potatoes were beets—loving this colorful melange of veggies! Well, beets would add another purple element! I love roasted veggies and these are so pretty. It does make for a great lunchtime salad bowl. Thanks for linking it up with Souper Sundays this week. (BTW–can you add the link to this post for me?) Mahalo! Now that’s a interesting combination of vegetables. Love each of these vegetables by themself, and never thought of combining them. How creative! I can’t wait for fall to make this over and over and over again.